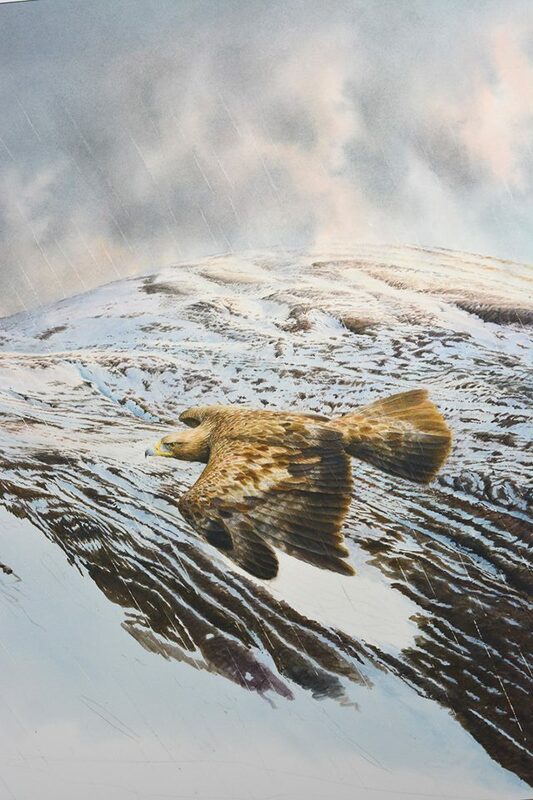 For the last few weeks, Colin has been working on a golden eagle painting, and now it’s finished! It’s one of the biggest paintings he has ever created, being about 30 inches across. This picture has been in Colin’s head for at least 10 years – in particular the background. He wanted the mountains to have the dramatic, striped effect of lying snow that has partly melted, with fresh snow showers raking the tops. Sunshine has briefly lit up the foreground on the left, as the squall blows across. The eagle appears unfazed by the weather (as eagles always are), sailing on powerful wings right into the teeth of the wind. Here are some photos of the painting in progress (click on any to see an enlargement). 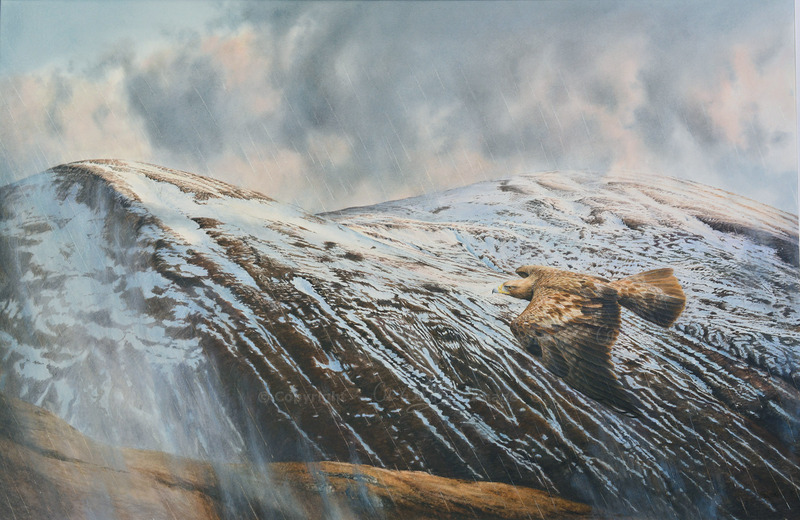 You can see this and many more of Colin’s paintings at www.wildart.co.uk. I really like when you show us the progress of his paintings, it’s fascinating to see how they beef out from start to finish. He’s captured that striped effect extremely well, but he had so much of it to paint! Does he ever get tired of doing a certain bit of a painting? I know he has incredible patience, but sometimes even his patience must be tried. 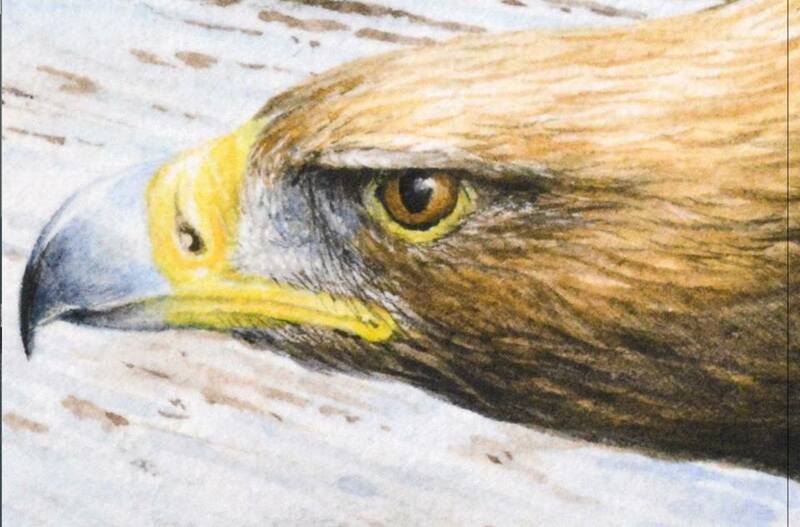 The close up of the eagle eye is wonderful. Thank you, Lorna! It is magnificent in real life too, and it was good fun watching it develop. Colin certainly does get tired of painting certain bits of a picture – he could name lots of instances! It’s usually scenes with buildings (lots of bricks or slates) or wide expanses of the same thing, such as heather. I know, the eye is amazing! The pic here is magnified way beyond real size. Thank you very much, Mike! I will do so. Colin did crack open a bottle of wine that evening! Exceptional work. I particularly like the fact that the background is as much a part of one’s view of the picture as is the eagle! An eagle in the landscape! That’s true, Ash – something Colin strives very hard to achieve. Thank you very much for your comment! The landscape is fantastic and the wondrous eagle, alive in all her beauty and power. As always, it is inspiring to see the progress and unfolding of such dedicated work. Congratulations!. Thank you very much, Carmen! That is much appreciated. I just love the landscape – you feel as if you’re flying into it with the eagle alongside you. Simply stunning. The detail not just in the eagle but the elements/landscape surrounding it is amazing. Congrats Colin. It’s just lovely. Thank you, Lynne! It really is one of those pictures you could just sit and gaze at for ages. That’s very true, it would! I’m in awe of anyone who can produce such a dramatic composition while maintaining amazingly fine detail. He is very talented indeed. I must say something. When you read “30 inches across” and you do live in a country where the metric system is used you say “30*2.5=something, perhaps big” perhaps you don’t realise the really size. Thank you very much, Cornel! Colin will appreciate that. I always have trouble with centimetres! But yes, it is quite big! I’m glad you like it. Thanks for the link – Colin met Dougie Baird (the travel writer) who was also at the opening of the Centre, and he wrote the feature. Wow. This is spectacular. Colin has incredible talent and such a wonderful eye for painting different perspectives. Thank you for yet another treat to enjoy. Thank you very much, Lyn! He does have a remarkable talent, you’re right. I am glad that you like it so much! Stunning. 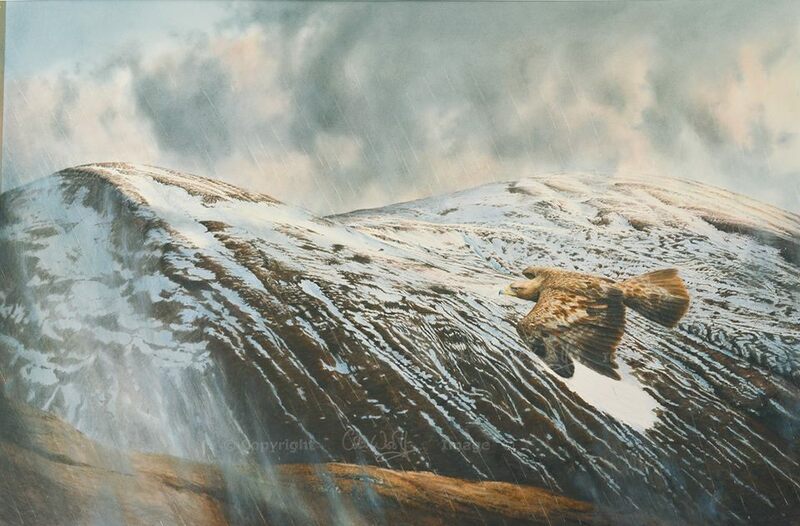 I immediately thought of the Cairngorms, where I have several times spotted an eagle or two sweeping in wide circles over the crags or hanging on currents of air. These hills look like Cairngorms to me, and in their most sobering state: when the half-melted snow reveals the bleak bones and contours of the land. A wonderful, evocative painting. Thank you very much! I love that effect too, when the snow is lying on the ‘bones’ of the hills – it makes them look so distant and inaccessible. 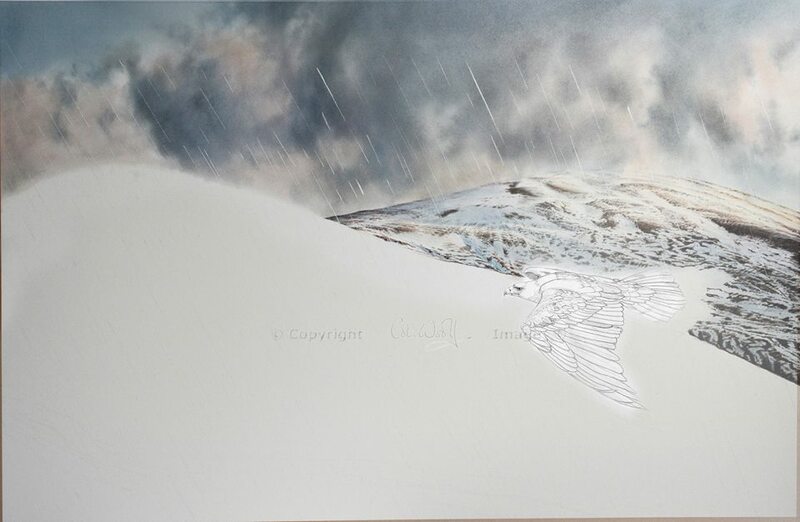 For the eagle, Colin was inspired by an encounter many years ago, and he wanted to convey the fact that it was totally unaffected by the storm.